Over the past few years, innovation prizes have become common with development partners seeking to sponsor innovations that are likely to yield solutions to common development challenges. The opportunities to take part in these innovation prizes are numerous. In recognition of the increasing prevelance of the innovation prizes, GVEP International recently did a study on their effectiveness to drive change in energy access in low-income settings. Although the challenges are well known, they’re worth examining in the context of innovation prizes. Perhaps the biggest for global competitions are innovations for clean energy in low-income settings. As noted in the recent report Progress Toward Sustainable Energy – Global Tracking Framework 2015, more than 40 percent of the world’s population still relies on solid fuels for cooking, keeping the goal of universal access to modern cooking by 2030 at a far distance. With regard to electrification, the report notes, “For sub-Saharan Africa as a whole – the region with by far the highest access deficit – electrification only just managed to stay abreast of population growth.” This means energy access especially in sub-Saharan Africa is lagging behind the 2030 targets set under the World Bank’s Sustainable Energy for All. The GVEP study addresses some of the major problems relating to energy access and the potential application of innovation prizes to these problems. The focus areas include clean cooking, mini-grid development and raising public awareness of the value offered by certain technologies. In the study Stimulating Solutions to Energy Access Through the Use of Innovation Prizes in Africa, key barriers to scaling up access to clean, modern energy were analyzed through conversations with around 120 sector experts. The major problem areas were then evaluated using a Technology Innovations System (TIS) model to identify specific factors blocking wider access to technologies and fuels. The potential application of innovation prizes to these challenges was then considered, based on lessons from the literature on those prizes and dialogue with sector experts. The study found that in most cases the factors limiting access to cleaner and more efficient energy supply are at the level of market formation, financing and policy. The challenges are not primarily of a technical/engineering nature, which means that the challenges lie in areas where innovation prizes have not been widely used, historically. There is very little hard evidence of the effectiveness of prizes. Where evidence exists, prizes seem to work best in stimulating new ideas and products, and in engaging the interest of people, organizations and communities on an issue. The study was conducted under the Ideas to Impact – a DFID-funded programme, which is experimenting with the use of innovation prizes to solve development challenges. The programme covers three broad thematic areas: water and sanitation, energy access and climate adaptation. The study further found that few, if any, of the energy access problems lend themselves to “global” solutions. The specific manifestations of a lack of access to energy vary from country to country, market to market, and technology to technology. 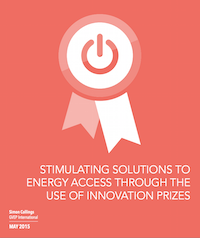 This finding challenges the assumption that prizes are a viable way to solve energy access problems. The study also reveals that even when technological innovations emerge, many never become commercially viable products, especially in the context of improving energy access. In most cases the factors limiting access to cleaner and more efficient energy supply are not primarily of a technical nature, therefore inventing more products, on its own, makes little difference. The report recommends that if innovation prizes are going to make a difference they need to help tackle some of the issues that prevent technologies from reaching the market, at the level of market formation, financing and policy. None of this is to say that innovation prizes have no value. Although they are the exception and not the rule, there are prize competitions meeting these challenges. The Big Green Challenge, organised by Nesta in 2008 in the UK and mentioned in the report, is often cited as an example of a successful prize that helped spur behaviour change. According to the report, the benefits of innovation challenges include generating new ideas/technological inventions or solutions, creating prestige for prize winners, creating public or sector awareness of a technology issue and motivating potential solvers to participate in finding a solution. At the Kenya Climate Innovation Center, we have certainly seen how prizes boost the confidence of the competing entrepreneurs/enterprises. Enterprises that have received public recognition in their industry are likely to gather interest from investors. For example, one of the enterprises enrolled in our incubator made it to the finals of 1776 Challenge Cup. Even though managers of the company, which makes solar roofing tiles, were not winners, their participation in the challenge brought them a lot of publicity and investors who considered working with them. The bottom line is the innovation prizes are useful, but we shouldn’t make the mistake that overcoming technical barriers will remedy much more deeply rooted economic challenges. Esther Kahinga is the Communications and Knowledge Management Officer at the Kenya Climate Innovation Center.